lJuly 2017: 24 of 31 days were spent on public land for one reason or another: cutting wood, leading day hike seminars, kayaking, day-hiking, backpacking. My life is consumed by public lands. National Parks. National Forests. BLM lands. Wildlife Refuges. National Monuments. Wilderness Areas. State lands. Public lands support my addiction to wilderness. These lands sustain my soul; enrich my spirit. They create strong friendship bonds. They provide beauty, nourishment, exercise, and health–both mental and physical. This year Jane, Diane and I spent nine days on Yellowstone Lake. Jane and I put in at West Thumb/Grant Village early one morning. The air was still, the lake a huge mirror. Paddling was a pleasure, like a hot knife through butter. These calm conditions continued each morning, though afternoons often became windy and sometimes stormy. Early to rise, early on the water, a morning stop for breakfast and tea, and no later than early afternoon, we were setting up our tents. 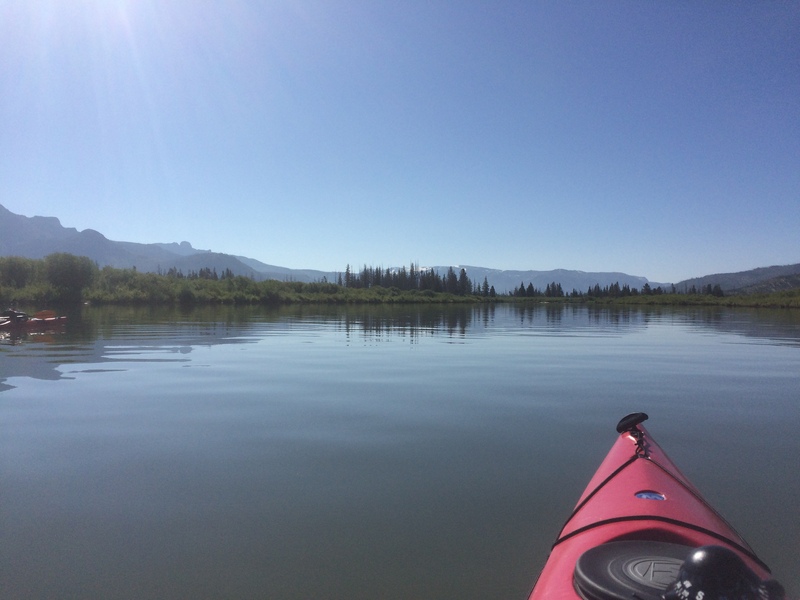 We paddled to Eagle Bay, down and up Flat Mountain Arm with a night at Flat Mountain Bay. Then to the bottom of South Arm, which was mirror flat, the first time in all the years I’ve kayaked Yellowstone Lake that I’ve ever seen it so smooth. Promontory Point with a hike to the top for views, then a day’s paddle into the Southeast Arm, where Diane joined us for the last five days. Each year we look for certain flowers. Usually the Fringed Gentian paint the Southeast Arm meadows purple. But this year we saw none. I wonder if it was too wet and boggy, or too early, or if the Fringed Gentian has a cycle of blooming. The Buckwheat, however, was going strong along the shore. 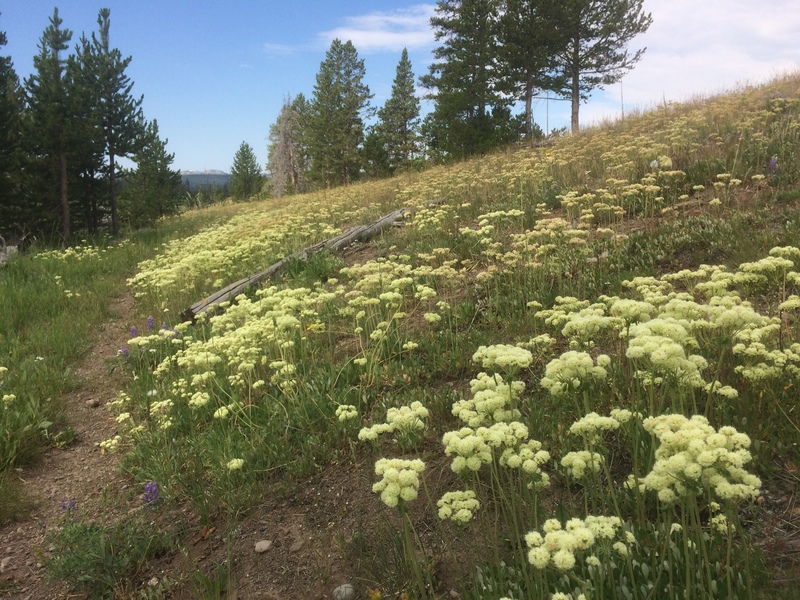 This seemed to be the strongest bloom of Buckwheat ever. It was everywhere, adding its creamy color and soft texture to trees fallen since the fires. We hiked what we call ‘The Triangle’ again this year. The first leg of the trail travels from the Southeast Arm to the South Arm to a place called ‘The Monument’. 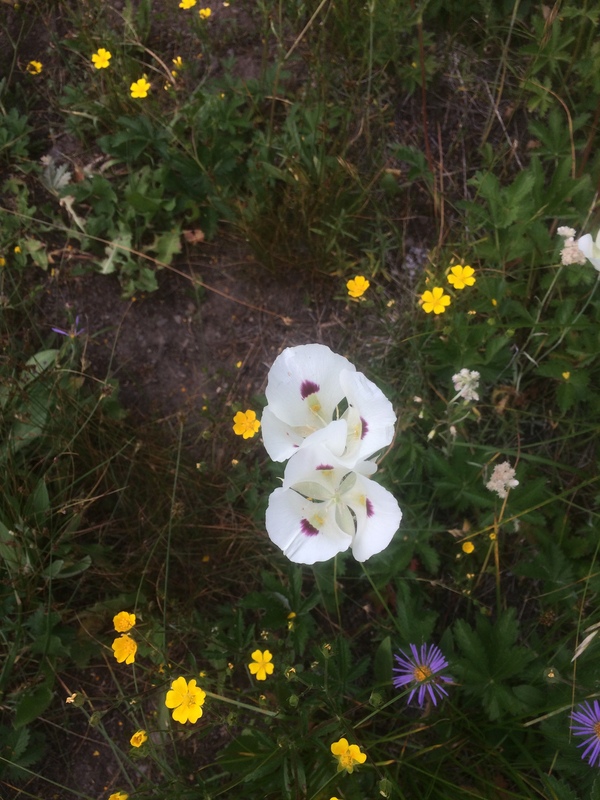 We always search for Lilies—Mariposa and/or Sego. This year was incredible. Lilies by the millions. Double and triple blooms on stems where in the past there would be only a single bloom. These are the most beautiful flowers. Looking for and finding them is a huge highlight of the trip. The first night we camp at Ouzel Lake, then pass the high point of Fossil Lake to find shelter in trees lower on the mountain. 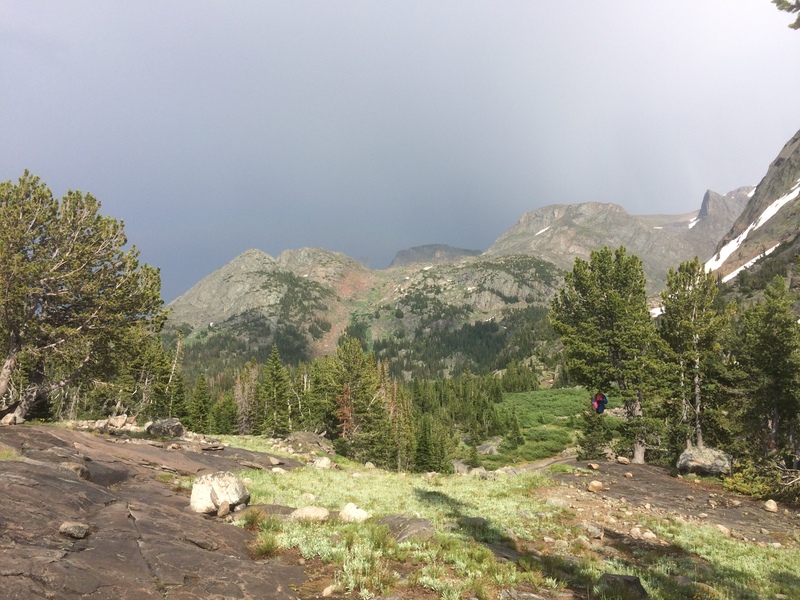 We were glad for the lower campsite when it stormed both nights of our lay-over. 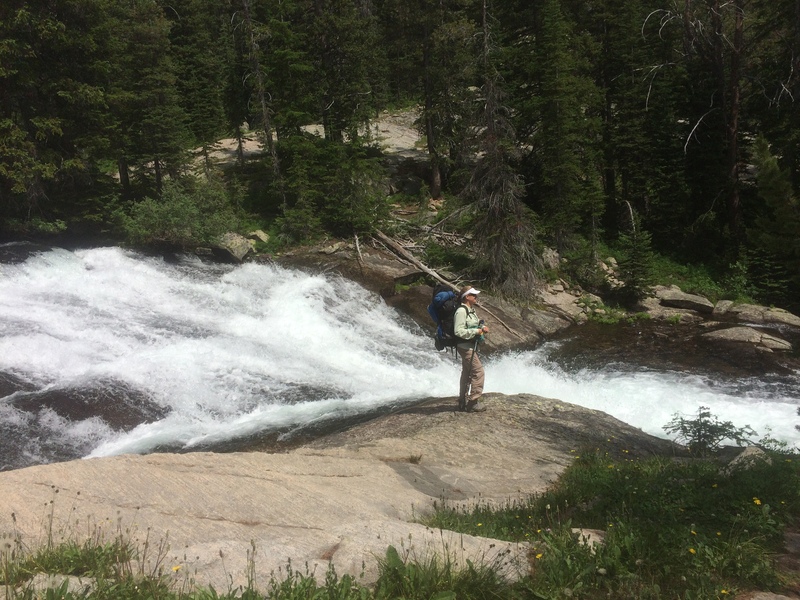 We spent one day wandering off trail among smooth bedrock and flowing streams. I have fallen in love with smooth bedrock, polished by glaciers and water 10,000 years ago. Today rushing streams caress the rock and make me wish I were a water drop sliding down the rock face. Two more days along a trail littered with lakes and waterfalls. More waterfalls than I could count, more than my eyes could take in. Rainbow Lake, Lake at the Falls, Rimrock Lake, Elk Lake: all were reason to stop and gaze in awe. 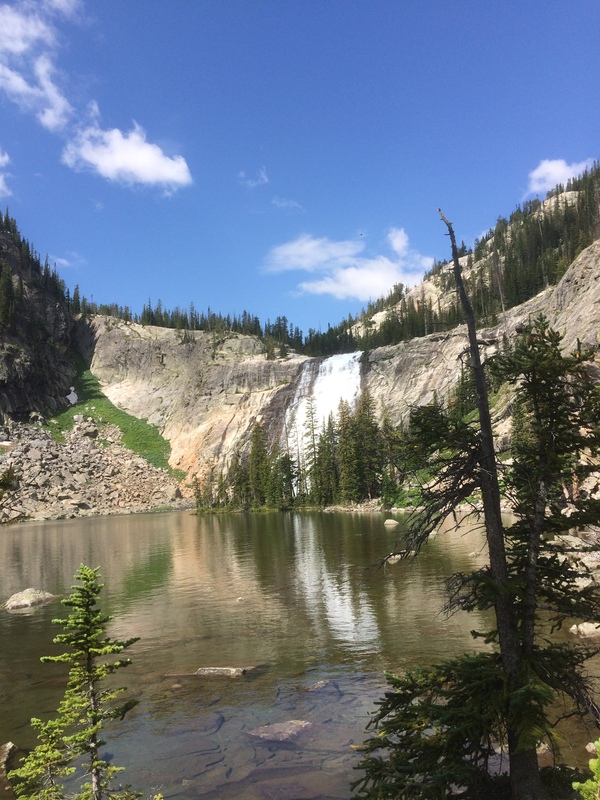 National Forests, national parks, national wilderness areas: The time I have spent on these public lands has sustained my soul, has healed any sadness I may have carried in with me. I have sat and looked, have breathed in and sighed in ecstasy at the peaks above me. I have sat and inhaled the surrounding majestic beauty and wildness. I have muscled and worked and sweat through trails and along waters. I have laughed with friends, have shared meals, forded streams, and talked about our passions long into the evening. I have given thanks more times than I can count for the opportunity to be in the wild, for the weather, for the friendships, for the beauty. Gratefulness permeates my soul. Thank you, LuAnn. 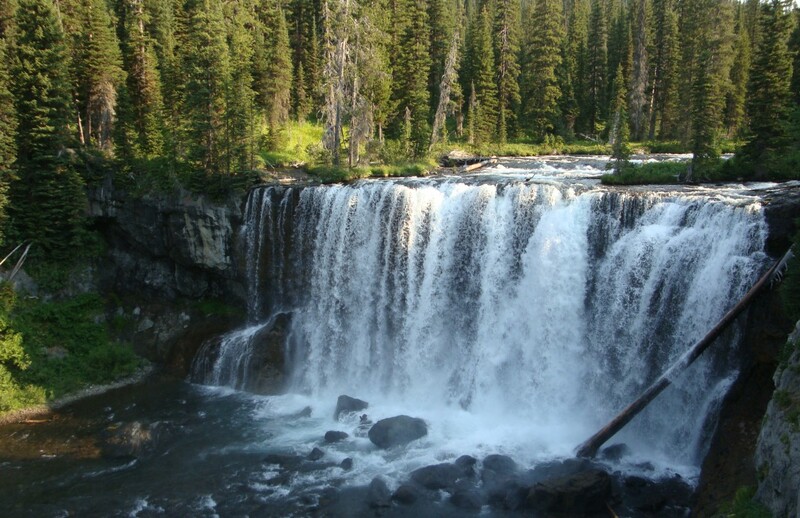 Yellowstone has changed my life… and I am SO looking forward to seeing you on the 20th!! WOOHOO!! Marvelous writing and photos. My visiting New Zealand friends just left this morning after less than a week. We all seemed to agree that water is the chief component of what Barb calls being in her “happy place.” Nowhere near as adventuresome as your travels, but we managed Palisade Falls and Grotto one day; Lava Lake in Gallatin Cyn another (followed by what they term a “flop day” to recover a bit); yesterday to Crescent Lake and a sweet stroll along the accessible trail at the campground on the way down Hyalite Canyon. Water and wildflowers and, sadly, smoky skies (far less so on the Lava Lake day). Barb, especially, would love this, Julianne, and they would both smile at your name, as one of their grown daughters is Julanne. Thank you! Thanks, Neysa! Sounds like you had some good beauty adventures, too. Feel free to pass on this blog to them Love that they have a daughter with the same name!! I hope she loves wildness, too. Good writing, good observations. Perhaps add a few more photos; (Mariposa & Sego Lilies). When you “give thanks more times than you can count,” I am curious; who/whom/what do you thank? It’s all about gratitude and gratefulness isn’t it? Thanks for telling me about your blog. Keep writing. You have a genuine talent that needs to be shared.